Before the creation of coins and banknotes all transaction and dealings were carried out by exchange of goods which is called barter. Since bartering was encountered with too many challenges and couldn’t ensure the needs of people considering the diversification of products, developments and new achievements, therefore precious metals such as copper, silver and gold were used as exchanging instruments that eased and developed the exchanging process. This trend was followed and continued by minting of different coins and printing and issuing of banknotes and now transactions are executed with advanced financial products that has accelerated and eased exchanging process much more than any other time. In Afghanistan, trade and dealing have also initiated with bartering and subsequently in different eras different coins have been used for trading purposes. Some of these coins have been minted outside and some inside Afghanistan. Coins from the eras of Achaemenians, Yunun-u Bakhtari, Saaks, kushanids, kidarids, Sasanids, Emerg ence of Islam, Ghaznaveds, Seljukids, Ghoorids, Ahmadshah Abdali, Amir Abdul Rahman khan, Habibullah khan kalakani, Mohmmad Nader khan, Mohmmad Zaher shah, Mahmmad Daud khan, people’s democratic party, Islamic state of Afghanistan, Afghanistan Islamic republic and… are those which have been used in trading in different eras of history. The first banknote of Afghanistan was printed and used beside coins in the period of Amanis. During the Rule of Amanullah Khan, first banknotes was issued in 1298 HS named kabuli Rupee which was latterly named Afghani. Between 1298-1299 HS banknotes of 1,5,50 and 100 were issued. Experts believe that, since banknote value in Amani period was designed in four languages (all in single banknote); Pashto, Dari, Urdu and Turkish, so it demonstrates that these banknotes were used beyond the border. In the period of Habibullah kalakani, newer banknotes were not printed but some banknotes from Amanullah khan Period were also approved and put on circulation in the country. In the period of king Nader Shah, Circulation of the banknote was stopped and it resumed use of gold and silver coins in trade as early times. During halt of the banknotes, new graph and money printing machineries were imported to general printing department of the country and Professor Ghulam Mohammad Maimanagi together with his colleagues skillfully designed Afghani banknotes. During the rule of King Mohammad Zaher khan in 1315 HS. Paper notes were being issued within the law that possessed 2 chapter and 21 articles. This law was arranged in 1314 HS. During Republic Government of Daud khan from 1352to 1357design of the banknotes was changed as the picture of Mohammad Zaher Shah was replaced with the picture of Mohammad Daud Khan. In this era, all the banknotes were printed and issued in the same design but with different colors. There were banknotes of 10, 20, 50,100 and 1000 Afghani in circulation. With the inception of Democratic Republic of Afghanistan, during the Rule of Noor Mohammad Taraki and Hafizullah Amin logo of “Khalq (people)”was placed on the banknotes, but for the first time Da Afghanistan Bank representing symbol was placed on the banknotes in 1358 HS during the Rule of parcham party- people’s Democratic party of Afghanistan. With the establishment of Islamic State of Afghanistan value of Afghani depreciated unprecedentedly which caused excessive printing and accumulation of Afghani. Depreciation of Afghani brought about printing of 5000 and 10000 Afghani banknotes and undermined commerce and business. During the regime of Taliban no newer banknotes were printed and old banknotes from previous period (Islamic state) were permissible in exchanges and used in trading. 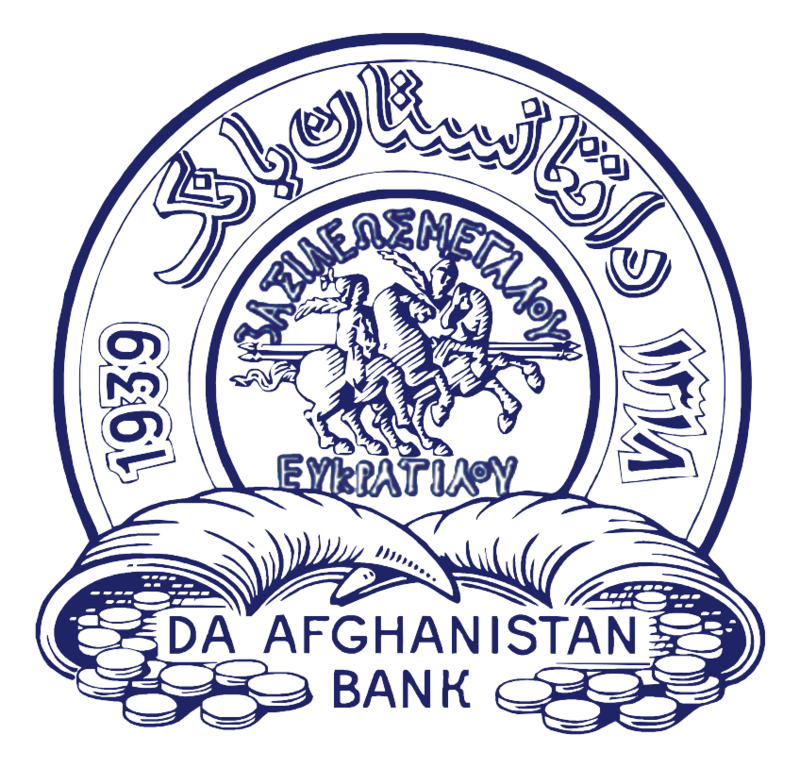 With the establishment of Interim Administration under the authority of H.E President Hamid Karzai, Da Afghanistan Bank reformed monetary affairs and with the removal of 3 zeros printed and issued banknotes of 1, 2, 5, 10, 20, 50, 100, 500 and 1000 Afghanis which now as prevalent Money of the country possess good and steady value and our honorable compatriots regard it as national identity and constantly strive for its promotion. In the mean time, once again coins of 1, 2, 5 Afghani have been minted and put in circulation for the commercial and economic deals of people.